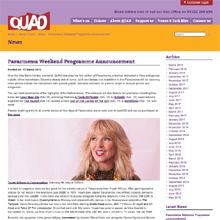 Over the May Bank Holiday weekend, QUAD launches the first edition of Paracinema, a festival dedicated to films and genres outside of the mainstream. Expect a steady diet of horror, sci-fi and fantasy but in addition to this Paracinema will be exploring other genres outside the mainstream with special guests, previews and talks on a whole range of unusual genres and subgenres. It is hard to imagine a more perfect guest for the eclectic nature of Paracinema than Toyah Willcox. After gaining positive notices for her debut in the television play Glitter in 1976, Toyah then played the anarchic role of Mad in Derek Jarman’s seminal punk film Jubilee . From there she went on to appear alongside Katherine Hepburn in the TV movie The Corn Is Green, in the mod classic Quadrophenia as Monkey and reteamed with Jarman in his Shakespeare adaptation The Tempest. Genre fans should note her role in the John Mills starring Quatermass series, BBC TV Movie Dr Jeykll and Mr Hyde and Tales Of The Unexpected. Since that early-mid 80s boom, Toyah has gone to appear as Miss Scarlett in the Cluedo TV Series, as Billie Piper’s mum in The Secret Diary Of A Call Girl, and in children’s TV series The Ink Thief. Recently she appeared in the genre defying Aaaaaaaah! by director Steve Oram and alongside Gabriel Byrne and Harvey Keitel in Lies We Tell. We are excited to welcome Toyah to Paracinema for an on-stage discussion of her screen career. • Continue reading at Derby QUAD. Visit Toyah’s 2018 Gig Diary at toyahwillcox.com for all confirmed dates and appearances.